Just wanted to update everyone on the site development - it's coming along pretty well. Mostly been working on the card section which will likely be the main homepage when launched (i.e. dealing with CSS/font/size logistics so that they work for both online viewing and when you "print" cards). The graphics page (at this particular moment in time anyway) will soon be changing its look quite a bit. Otherwise, things are moving along. Would be great to get image submissions flowing again if you get a chance to bug people about the project. I am digging the "flip card" animation - can't wait to see the design on the reverse of the cards. And the photo set / graphic set toggle is excellent! 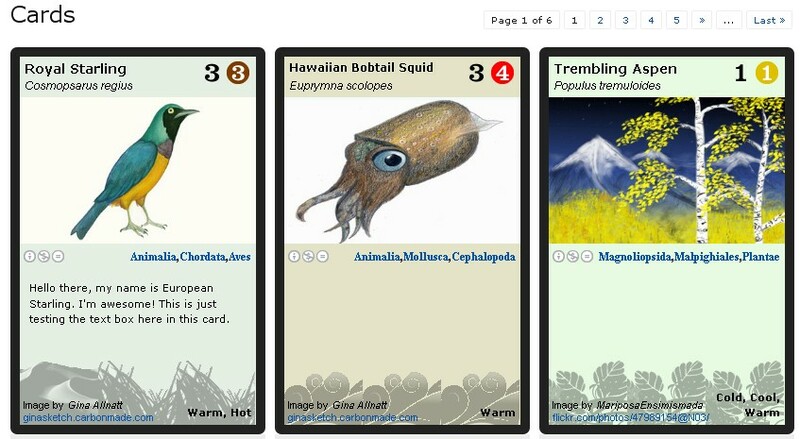 I also like the links to filter all cards by phylum and class. Probably should allow this option to both filter all cards and filter "my cards". Can we have the same filter for the hot/cold/cool/warm biomes, or would that be too much? Suggestion: overlay the CC copyleft notices onto the bottom left of the card art rectangle. This should free more room for long classification names. I'm very pleased those icons are all links, by the way. Is there a reason animals go from kingdom downward to class but plants go from order upward to kingdom? Typo: "ckecking", under Selected Cards. Also, and this has nothing to do with the site itself, I love the dune at the bottom of the event and hot/dry cards - looks great! Yeah, the classification is based on tags, which default to alphabetical order, but working on a fix for that. Also, will be adding a few other options with the "select" functions, so that things are a little easier to organize. The reverse will basically be general info - maybe for now will have general things like a link to the EOL or wiki or something to that effect. Original/longer/ or even game related write ups may have to depend on who in the web feels like helping out. The nice thing about the set up, is that since each card is essentially an overlay of various pieces of data, the option of developing cross over into things like online games should (in theory anyway) be really easy to do. As well, we also plan on releasing the wordpress template, so if others want to make other "card games" using this software, then they can! What are the back of the cards going to have on them? The "real" backs will be some sort of design that is busy enough that we can cut the sheet of paper 6 (pr 9) ways and it looks more or less the same. I've been wondering what the 'photo' cards will look like... because unfortunately, I don't think my attempts at art can compete with what we have so far. But I do think some of my photography may work, which I'll submit very soon to the flickr group. EDIT: Which I just submitted! Tell me what you guys think! Oh my goodness. This looks really cool. I really think the flip side should have fun interesting facts/trivia about the animal. No point in regurgitating wikipedia if you have a link there already. Paleo_Orca: IMHO I wouldn't worry about not "competing." It's the spirit of contributing that is most important in the end, especially since an image will never get chosen if you don't submit it! Plus, you already draw a thousand times better than me. Looking good. A humble suggestion: Can you provide an API of sort for accessing card details (image, text, background, etcetera) for individual cards, and for accessing sets of cards? I ask because printing from browsers is iffy at best, especially if some users are inevitably going to want to print double sided, with card backs as well. I'd be more than happy to write a PDF generator that generates sheets of cards from a list of cards and their details, but that requires some sort of programmatic access to the information. This would also open the door for other uses - custom card formats, or even an online version of the game! I would like a border radius of at least 5px for li.card, li.card-in-queue, div.card. Paleo: Your photos are awesome! (yours too Naturalismus). Hoping for some pics that overlap with the ones available for graphics (the posts are set up so that when cards are assembled, you can provide data for both the drawing and photo versions. So, as of right now, the biggest limiting factor is getting more art? Thanks for the suggestion. We'll be definitely making such info available, especially once the website is launch proper (we'll even release the wordpress template running the site). Essentially, the idea is that programming logistics is basically open source, so that improvements/additions on the site can be possible either locally, or via other set-ups. The pdf idea, we've actually looked into. And you're right, it's does make the formatting of card printing much more straight forward. The problem we expect going that route, is that it could be a huge server strain (especially if lots of people are interested in the site). i.e. if 100 people visit, select 6 cards, hi res pdfs are made for these 100 people, and then downloaded more or less at the same time, there may be issues with bandwidth, what the server can handle, etc. Still, if you think there's a way around this, and still go the pdf route, then that would definitely be something worth looking into! It's basically the "start." We need art, to entertain the card, to entertain the card being used in the game, and so on. For fun, I've also been testing how "doable" it is to get specific images by just scanning deviantart or flickr and asking for permission to use. I've been pretty pleased to find that it's actually fairly straight forward to do this, so from the point of view of getting images for a "set", it's looking like this is a very straightforward "plan B." Of course, to meet the holy grail of having thousands and thousands of cards over time, it'll very much require the art community in particular to participate! As I understand it, you've got the card-data stored in some sort of database, and when you need a card for Species X, you retrieve the Species X data from the database, and pour said data into a template. PHP template, PDF template, whatever -- a template is a template. So it doesn't seem like there should be any problems with using multiple templates; we can have a PHP template for displaying the cards on the web, and a PDF template for printing out high-resolution versions of the cards, and so forth. This way, we can have all the same data on a card no matter what, but at the same time web-based restrictions need not apply to all versions of the cards. If it would be a drain on the server to create [number] different hi-res cards at a time, what about doing the creation "offline" and storing the results for later use? Of course you'd still have to worry about bandwidth issues when [number] people try to download however-many hi-res cards at the same time, but at least the machine wouldn't also need to create everything right then and there. Yeah, right now, because the card is basically just data from a database (and some of that info is actually not even from our servers - i.e. the image from Flickr) and a CSS stylesheet, printing direct from the browser uses practically no resources from the server. The folks programming the site (our university's Office of Learning Technology), tell me that with the easy pdf fix, you essentially embed all of that info into a styled pdf file (create the pdf file but not just the one representing the normal "print preview" -an actual formatted version), host it momentarily on the server and allow the user to download from that temp pdf file. In all the pdf creation step and the actual pdf downloading step do require work from the server. They said it isn't like hosting video which can be very resource intensive, but if we expect a LOT of users it may just be enough to require some significant server infrastructure (i.e. $$) down the road. My lab currently has two reasonably powerful servers (we also host scq.ubc.ca, terry.ubc.ca, and bioteach.ubc.ca - in all they attract about 20,000 visitors a day and are currently only using about 0.2% of our server's resources), and initial estimates suggest that we're "probably" o.k. with the pdf route but there is still the possibility for issues. For the site to freeze on us when the interest is high would be a big loss. As well, we're also trying to develop a system that has potential use outside our site (i.e. the wordpress template will be made available for anyone to use and tweak). The reasoning was that if we allowed the pdf version from the beginning, it may limit the usefulness of the template for people using it without access or funds to host under these relatively intensive circumstances. Anyway, this kind of discussion is really great, since it sets the stage for an additional community to get involved in the project (the open source, progamming community). And I think we'll still have a go in that when sets are initially offered, we'll have special multipage pdf files that people can download (kind of like it's ready to go), and monitor the load from there. The programmers did seem to suggest that doing the pdf route and coming up with something that addresses the bandwidth load is probably doable, but that it could be something tackled later or (perhaps other folks can have a shot). I think once the wordpress template is released, I'll basically release it on this forum so that threads with the programming angle can be encouraged. Thanks for the note on the bug Naturalismus. We're just arranging for the site to migrate over to my server, and then will start doing the "final tweaking" For the classification issue, probably the easiest fix is to change the font to something that tends to be the same throughout all systems (courier can be quite varied). Maybe a times italic? I don't think generating a PDF is as hard as you think it is. Nevertheless, that's why I was suggesting an API - then someone like myself can write a printable PDF generator that uses the API to grab the necessary data, and does the generation work itself. If I were writing such a service, I'd write it on App Engine, which certainly scales*. In fact, if you're at all interested in moving from a dedicated hosting solution, I'm more than happy to provide support in writing a site such as this on App Engine. * Disclosure: I'm on the Google App Engine team, so I'm obviously biased. That sounds great! Can I link you up with the programming folks at my end (i.e. permission to pass your email address to them)? Let me know, and we'll go from there. p.s. I'm not a programmer myself, but I took a quick look at the google app engine and it does look like the exact sort of thing that would work. Sure! My email address is nick dot johnson at google dot com. I think in addition to allowing people to print the cards (I'm assuming for free) off the web I think some should be put into actual print and be purchasable from the site. The profits from the sale of this deck could go torwards conservation efforts furthering it's cause while still allowing everyone access to the cards.